Since his early days with the groundbreaking 80's Soul trio Tony! Toni! Toné!, Raphael Saadiq has carried the torch for old-school R&B and in the process has established his place as one of music's most highly-regarded recording artists and producers. In addition to releasing a series of critically acclaimed solo albums that have garnered multiple GRAMMY nominations, Saadiq has also worked behind-the-scenes as an award-winning producer, collaborator and sideman for some of music's biggest acts. In the Museum's 200-seat Clive Davis Theater, hear this true one-man show discuss the contemporary spin he puts on a classic sound, his experience out on the road and why he feels that he's now at the peak of his creativity. An audience Q&A and stripped-down performance will follow the discussion. 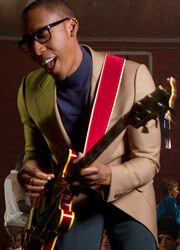 Be among the first to hear selections from Saadiq's acclaimed new album, Stone Rollin', set for release on May 10, 2011. GRAMMY Museum Executive Director Bob Santelli will moderate.